A Canadian First World War soldier killed in action nearly a century ago can finally rest in peace following the identification of his remains and his burial last week in France. This resolution was possible due to a novel combination of identification disciplines, including that of Burlington, MA company Z Corporation’s 3D printing technology. “Although it’s sad to contemplate the loss of young lives in war, it’s rewarding to account for the missing, both for the sake of the deceased and for long-grieving family members,” said Andrew J. Nelson, a key researcher on the project and Associate Dean of Research for the Faculty of Social Science at the University of Western Ontario. Using muscle markings on the skull model, scientific tissue-depth tables and plastilina modeling clay, the team worked with noted Canadian artist Christian Corbet to construct a face on the model. They then photographed that face, and superimposed images of it on photographs of soldiers who were potential matches. By seeing how the images lined up – by face height, width and features such as jaw shape – the team was able to narrow the list of potential matches to two. An isotopic analysis of teeth and the jaw bone indicated that the recovered soldier grew up in Dublin – a direct biographical match with Lawless. 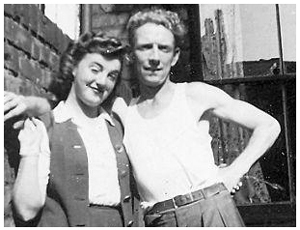 To see photos of the rebuilding process, please visit Military Historian Jeremy Banning’s site, where he has posted the images with full permission of Christian Corbet. Until the recent discovery of his remains, Private Peterson was one of the more than 11,000 Canadian soldiers who died in France during the First World War and who have no known grave. 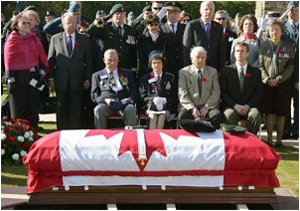 Private Herbert Peterson burial photo credit: from the blog of military historian Jeremy Banning. Nelson sees a variety of applications for 3D printing in anthropology beyond the identification of soldiers’ remains. For example, his team used Z Corporation 3D printing in the 2003 facial reconstruction of the Sulman Egyptian mummy housed at the Chatham-Kent Museum in Chatham, Ontario. The facial reconstruction of the mummy was also done by Christian Corbet. This entry was posted on Tuesday, March 22nd, 2011 at 8:29 am and is filed under Editorials, Education, New Releases. You can follow any responses to this entry through the RSS 2.0 feed. You can leave a response, or trackback from your own site.